The terrorist attacks of September 11, 2001, have set off an extraordinary surge of publications across the humanities and social sciences. 9/11 accelerated the transnational turn in American literary and cultural studies and added urgency to ongoing investigations of trauma, representation, ethics, and religion. 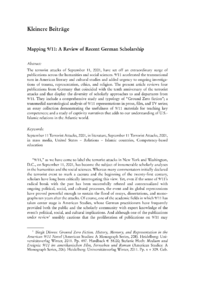 The present article reviews four publications from Germany that coincided with the tenth anniversary of the terrorist attacks and that display the diversity of scholarly approaches to and departures from 9/11. They include a comprehensive study and typology of Ground Zero fiction; a transmedial narratological analysis of 9/11 representations in prose, film, and TV series; an essay collection demonstrating the usefulness of 9/11 materials for teaching key competences; and a study of captivity narratives that adds to our understanding of U.S.- Islamic relations in the Atlantic world.